The tow to Thailand of the American Star. 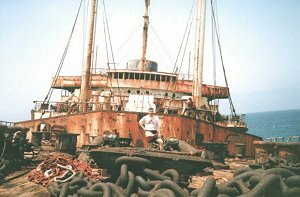 Preparing and towing the American Star to Thailand. Story taken from the Steamboat Bill Magazine. Journal of the Steamship Historical Society of America. This page is about the American Star drydocking period and the preparation for the tow. The Owners and my family are still thinking of the American Star, the loss of her caused us all a great shock. The story of the ships preparation is what follows. The vessel had been bought by Chaophraya Development Transport Company in October 1993 for $2 million dollars. The plan was to have the vessel prepared as soon as possible and then tow her Thailand, where major work would be carried out in order for the vessel to serve as a five-star floating hotel off of Phuket. The vessel had been towed to Hellenic Shipyards for the preparation work, which was assisted by a team of contractors. The total of about $15 million had been spent for the work which was supervised by Salvage Association and the American Bureau of Shipping, Piraeus Branch. The ship remained in drydock for 68 days, and, after ultrasonic inspection and repairs, the hull was certified by A.B.S. 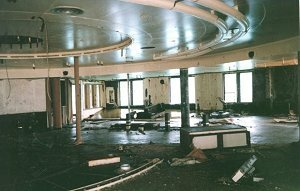 for twelve years, provided it served as a floating hotel. The tow contract was entrusted to Marman, a Wijsmuller sister company, and the total agreed amount was $920,000 for the tow of the American Star from Piraeus, Greece, to Phuket, Thailand, a tourist area in the southwest of The country. The expected tow duration was about 100 days and the expected average speed 55 knots. The Salvage Association-approved tug was a Ukrainian flag tug, Neftegaz 67, a very modern tug built in Poland. American Star was insured in the London market by Lowndes Lambert Group. 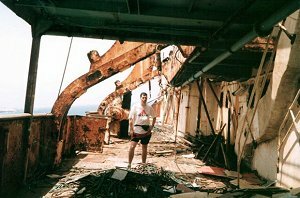 Captain of the American Star from the date of purchase and until the date it was to be towed from Greece to Thailand was Captain Nick Rigas, a captain with great experience on cruise liners. The tug arrived a week before Christmas Eve and everything was ready by Christmas Eve. By early afternoon, American Star left Eleusis Bay heading to Piraeus Roads, towed by Neftegaz 67 and five Greek tugs of the Karapiperis Tug Company and by eight in the evening the American Star had left Piraeus Roads for Phuket, Thailand. During the long tow voyage, four port calls were scheduled by Salvage Association; The first at Dakar, Senegal and the last at the Isle of Reunion. The day after, and less than twenty hours after departure, I was informed by Neftegaz 67 that due to very bad weather the American Star was yawing side to side and sometimes was overpassing the tug. I instructed the Captain to return to Piraeus Roads in order to solve the problem, if any. On board the Neftegaz 67 was also a Dutch tug captain as tow supervisor. The vessel returned the day after in the early afternoon. After several meetings, it had been decided to wait for the weather to calm down, and, in order to control the yawing when crossing the Greek Islands Straits, to construct, install and connect at the vessel's stern, a specially made floating anchor. The vessel sailed again on New Years Eve, December 31st, with full success. This was the end of the American Star. Some days later I heard that a German tourist, a visitor to the island, tried to go onboard, but when he got close to the ship he was injured and never found again. 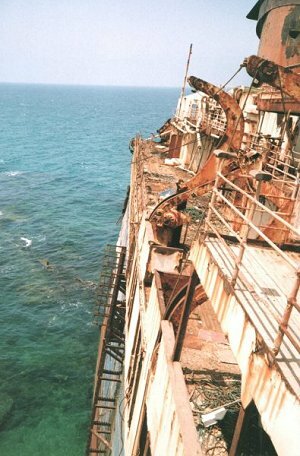 After investigations by various experts, it was decided that the vessel be considered a total loss, and as the wreck could not be removed, the only solution would be to cut it into about 32 to 36 pieces and dump them into the ocean's deep waters, this never materialised as it would have been a very expensive project. The vessel had much potential, and with the loss of the American Star, the work and dreams of so many people involved for more than a year have been lost too. A marine engineer who resides in Athens, Greece. 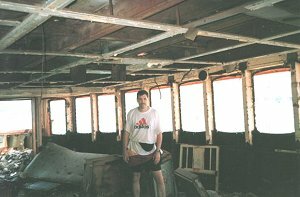 Stamos C. Ioannou was the General Manager of the restoration project of the American Star. The photos below are courtesy of ex-passenger Steve Tacey.